So that’s what Christian and his Christian friends did. They washed T Bone’s clothes. Not his feet or his hands – his clothes. T-Bone’s desire for worth and welcome is found in us all. We all yearn to be treated as human beings. Christian never thought that this simple conversation 12+ years ago would spark an idea that continues to influence and care for tens of thousands of people every month. The creative and collective energy used to sustain, expand, and share Laundry Love reminds us that every human being has tremendous worth, value, and possibility. To date an estimated 600,000+ loads of laundry has been done, and over 450,000 people cared for across the United States under the umbrella concept of Laundry Love. Laundry Love is a neighboring movement that partners with individuals, groups, and laundromats to care for the poor, vulnerable, and marginalized throughout the U.S. Laundry Love believes that through the neutral space of a laundromat, every guest and stranger can become a friend. 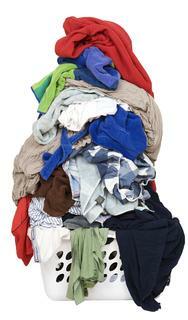 There are 30,000+ laundromats nationwide; Mr. Steve’s Laundry in Bristol, CT is the closest to us. These missional folks dream to see a Laundry Love effort established in every laundromat. They talk about “smuggling love & hustling hope.” Laundry love is not a service project or something you “do to” “or for” people. It’s an expression of living “with” others. It is giving hope and wholeness in a new way. It is a story of resurrection. Today’s readings all point to resurrection and the One who leads us to wholeness and new life. In Acts, Luke documents the joyous effect the early churches had on their local communities. The Christians in Jerusalem, Luke argued, were fabulous neighbors. They “shared their meals with great joy and generosity – all the while praising God and enjoying the goodwill of all the people (Acts 2:46-47). And it is one of those examples that we read about today in Peter’s encounter with the new church community in Joppa, which is modern day Tel Aviv. This is the same Peter, who just a few weeks ago abandoned and denied Christ at his arrest and trial before Pilate. And like Paul from last week, Peter has a life-changing experience that transforms his life forever. He is called to the home of a faithful woman who has died, named Tabitha, whose Greek name is Dorcas. Her dual name suggests the she was a cultural hybrid of sorts; straddling the cultural line between Judaism and the wider Greco-Roman world. She is at home in the comfortable cultural confines of her faith as a new Christian, but also in the different cultures that surround her. She is not the typical Jew that Peter was used to hanging around with, as he felt his mission was to convert Jewish people to be followers of the Way, the name the first Christians were called. It is clear that Luke wants his readers to be certain that the power demonstrated by the risen Lord is now manifest in those who follow him in the early community of faith. And it is Peter now who has the ability to raise the dead. New and renewed life wasn’t just for Jesus on Easter — life is meant for the rest of us too. Who is this Dorcas/Tabitha woman? She is remembered as a person of deep faith and creativity. It is interesting to note that Luke calls her a “female disciple” (mathetria in Greek), the only one named in the New Testament. Remember, discipleship is rooted in healing the sick, feeding the poor, and doing good works in the name of Christ. That seems to be Dorcas’ M.O. The early church community established in Joppa was known as a center of evangelism and well-organized social service. Possibly Dorcas came to know Christ in this community and caught the vision of how she could serve Christ with her money and her needle. We do not read that Dorcas sewed to support herself. Perhaps she made garments and gave them to whomever was in need. When Luke says that Dorcas was full of good works, he meant the word “full” to refer primarily to her inward grace, which prompted outward deeds. With Dorcas, being good meant doing good. Her many good works flowed from a heart grateful to God for Jesus’ saving grace. Dorcas did not go out into the world – the mission field – but she found a field of endeavor at her doorstep. She was alert to the possibilities around her. Hers was a transformed life that was an example to her community. As Peter arrives we can picture a living fashion show – the work of her hands walking around with the widows telling stories of her love and compassion. Their love for Dorcas leads to a belief in Christ that is rooted in hope and in trust. 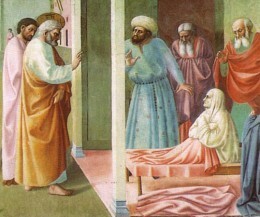 The miracle of her return to life from death was important to the early church. People could see Dorcas and speak with her. As a walking proclamation of the truth and power of God, she also sets an example in her daily life that holds significance to us today. There are many stories around us today about transformation in the same way Dorcas changed those who lived around her. Laundry Love is one of them. Because of the witness of so many who are living out the mission of God in our communities, hope is being given. God is always calling us out of our comfort zones – into the mission field – to meet those who we might call “other,” those unlike ourselves. I’m sure each of you can name some other missional action. The good news is such movements are bringing life where there is death, love where there is hate, healing where there is brokenness. Such acts of mercy and charity in the name of Christ helps people stand on their feet, communities make their way out of traps of poverty, enemies move toward reconciliation, despairing people find meaning again. When the church is made up of transformed people, we can witness something of the coming day when the gospel is proclaimed in action rather than word. Such a transformation is only possible through the Spirit of Christ acting within each of us. Go and do likewise. Amen. What is being made new in your life? What is metaphorically being raised from the dead? How do we witness the miraculous life and the loving life of Christ’s kingdom community at —– (fill in the blank with your church or community)? How do we help in the transformation of the people we encounter every day of our lives? How are you being transformed so that you can be Dorcas to those you meet, offering your garments of hope to them?